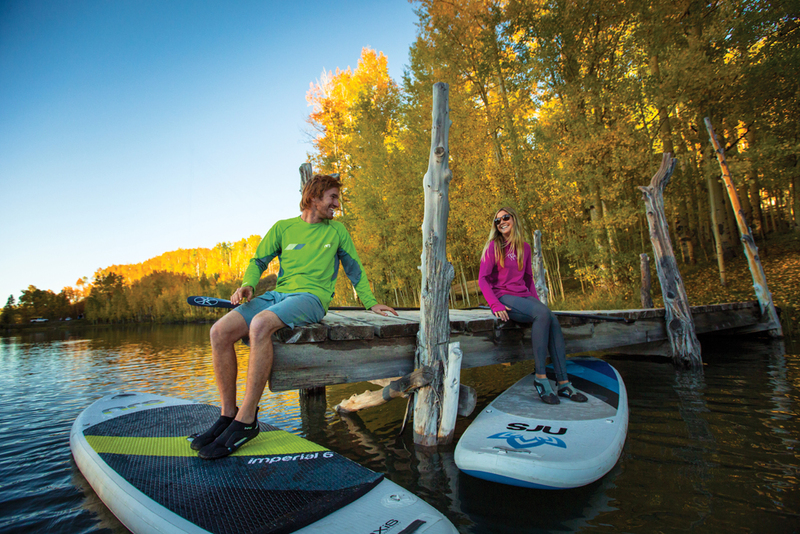 This guide will help you understand paddle board rentals in Crested Butte, Colorado. You will learn of the Float-Shack online booking system, the types of stand up paddle boards we use for rentals and our safety gear. The complete SUP rental experience will be discussed. To finish, we will share our favorite SUP spots we tend to go paddle. The Float-Shack has two convenient ways to book your stand up paddle board reservation. The most convenient way to book is using our new online booking software. Choose between a SUP or a river float tube and then pick a date and time slot. Its that easy. We still take phone reservations at (970) 209-9747. The Float-Shack now offers free delivery of paddle boards to your residence, condo or hotel. Our staff will personally outfit your entire party with SUP, paddle and PFD. Your group will get a short parking lot instruction and explanation of all gear. Meanwhile, all paddle boards will be loaded onto your vehicle for travel. Be sure to pay attention to the correct mounting, as you will be loading for your return. We also will arrange for pick up on certain trips and occasions. All reservations are required to be returned by designated time and place of drop off. Please return all SUP, paddles and PFDs clean. New for 2017 NRS inflatable Stand Up Paddle Boards and River Float Tubes. The Float-Shack has many models and sizes to choose. We have 4″ and 6″ size boards designed for touring, river and wave surfing and fitness paddling too. We have a SUP for everyone. All Stand Up Paddle Board rentals come with a leash and one PFD. The leash will be specific to the planned activity. We have special emergency release leash designed for river floats. We all have our favorite spots for paddle boarding adventures. Here are a few of ours. Start at the recreation path bridge on the east side of Crested Butte. Take Teocalli Ave. east past 9th St to access the Slate River Recreational Path Bridge – put in. Take out is the HWY 135 Bridge just past Crested Butte Country Club. Stop at the nice grassy area, its on South side of Slate River immediately before the HWY Bridge. You will find great access to parking off the highway, right by the Crested Butte Country Club signage. This section is without any whitewater. The Slate River twists and turns many times through open ranch land right on the edge of town. The peak of Mt Crested Butte towers above offering spectacular views and amazing scenery for a summer float. Times vary with the snow melt off and river flows. Generally speaking, expect the highest flows in June, moderate flows in July and August, and September is not recommended due to low flows and cattle entering the area. Keep in mind recent rain will change the normal flow for a day or so. 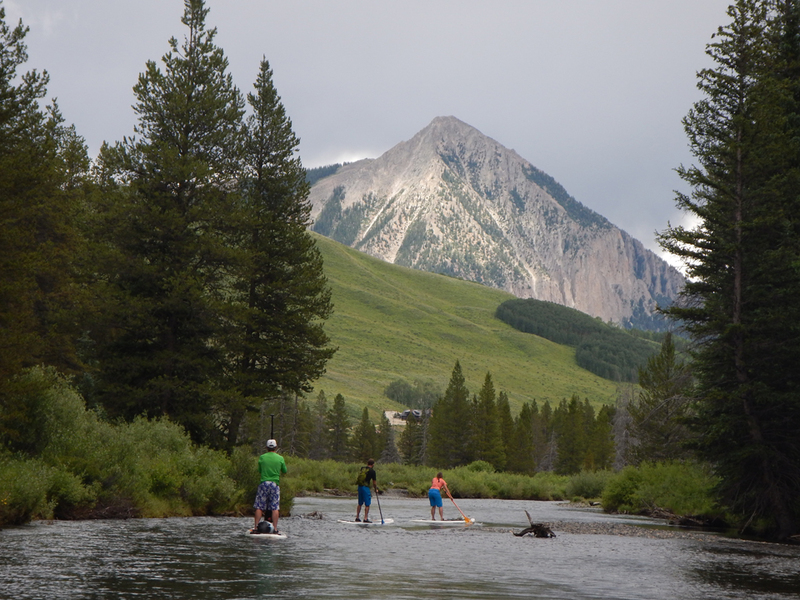 Three friends enjoy a summer float down Upper Slate River with Crested Butte towering in the background. Start at the Gunsight Pass Bridge located on Slate River Road. Take 6th St/ Gothic Road north out of Crested Butte. Slate River Road  is the first left turn. Follow this past Nicholson Lake for a total of about 2 miles. On the left you will see  and a sign for Gunsight Pass Bridge. High clearance vehicles may travel down to the river as there are many car swallowing pot holes on this section of road. The Recreation Path Bridge, east of Teocalli Ave. will be the first take out. The second option is the HWY 135 Bridge as described above, for a full day of floating fun! Great wildlife viewing as you will pass through a wildlife sanctuary, known for Great Blue Heron, Red Tail Hawk and Bald Eagles. Plenty of stopping and viewing stops are available along the way. This section may not be suitable for children to navigate by themselves. Float times vary, with the snow melt and river flows. A recent rain shower will add to the normal flow for a day or two. Plan for the highest water flows in June, then moderate flows in July and August. Floating the Slate River during September is not recommended due to cattle entering the area. Great for Full Day, ½ day and Evening adventures. 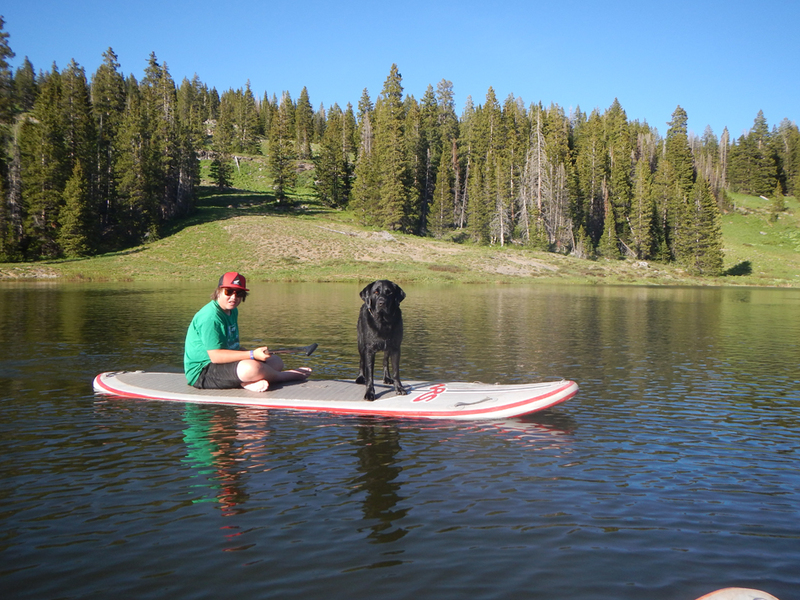 A young man and his dog share a SUP for a afternoon Lake Irwin float. Take Whiterock Ave. west out of Crested Butte. Eventually, this road will change to . In several miles, you will start to enter a wide open meadow (on left) and the road will make a gentle sweeping left across the entire meadow. Begin to start looking for signs and a right turn to Irwin Lake and Campground. This is also what locals refer to as the “Y.” Follow this road [12E] to Irwin Lake and Campground. The route is suitable for low clearance vehicles and is around 12 miles total one way. Great family fun for full day, ½ day and evening adventures. Unfortunately, The US Forest Service PROHIBITS the Float-Shack from delivering or instructing on Lake Irwin. We apologize for this strict policy.